On the last day of hubby's vacation here in the Philippines, we've decided to give him a treat. We wanted his last day to be well remembered and memorable so we have arranged for a family fun day and that includes a visit to harbor Point inside SBMA, a whole body massage treat at City Spa, an afternoon snack at a Korean restaurant and a coffee treat at Bread Time. We have strolled around the mall and decided to have some photo shoots at the River Walk. Afterwards, we sent hubby to City Spa for the pre booked full body massage. He felt so relaxed and refreshed after that massage and we told him that that is a bonus treat for all his hard work while he was here with us in the Philippines. You see, he's practically doing something everyday in the house since he arrived last April and that includes cleaning, tidying up, repainting, supervising repair works, cooking and even buying our foods from the wet market. He really would like to make it up to us for the lost times and we appreciated it very much. Since our son Edmar has a lot of Korean friends, he's so familiar with all the Korean restaurants around the city and inside SBMA that's why he has decided to bring us to a Korean restaurant for an afternoon snack. The hot Ramen soup tastes heavenly and hubby enjoyed his bottle of Korean Beer while me, my daughter Mika and Edmar had a taste of their flavorful ice cream on stick which really tastes great and cheap too. We had a short walk afterwards before we headed to Bread Time for our coffee break. We can't do much as Mika still have to attend her afternoon classes in school. 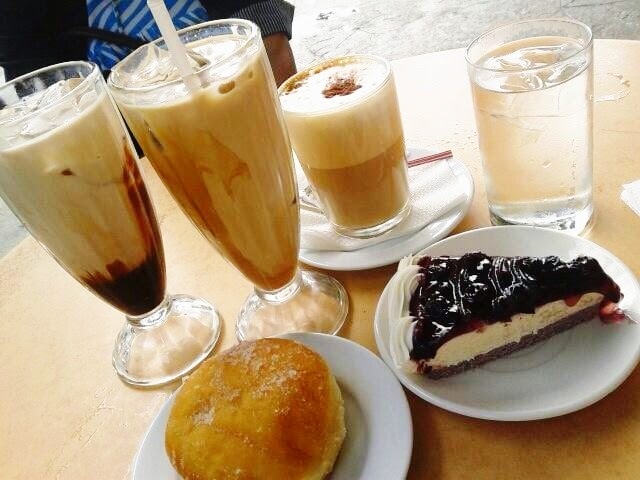 We've ordered some cakes and pastries as well as glasses of iced and hot coffee. I really love that blue berry cheese cake....perfect for a cup of hot cappuccino. Edmar and hubby had their share of iced coffee latte while Mika just had a slice of cake and iced water. She doesn't drink coffee and that makes her unique. Me and my son are both coffee lovers and every single day will not be complete without a cup or two of our favorite coffee mixes. The day ended well. Hubby was so pleased with our "little surprise". We all went home happy and that smile in hubby's face was so precious.